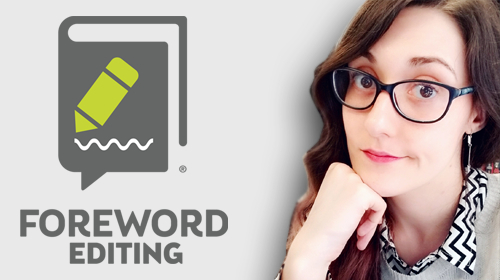 Foreword is pleased to announce an addition to its suite of services: Foreword Editing—headed by Danielle Ballantyne, an experienced editor fresh from Tor Books. We sat down with Danielle to learn more about this new service and why it’s still necessary in the Information Age. Can you talk about the differences between developmental and copy editing, and why a manuscript might need developmental editing, specifically? Copy editing is something just about all written content will go through, whether it’s a novel or a vague statement from a red-handed celebrity’s publicist. Its focus is rather narrow, interested only in technical or grammatical errors, the things that are objectively wrong with the language or formatting. Developmental editing is about all of that too, of course, but it expands from just fixing things that are wrong to looking at things that can be improved. Within the context of a fiction manuscript, a developmental edit would look at everything from pacing to plot holes, offering suggestions on how to, for example, make a character’s death more impactful or the dialogue more natural. For authors, when you have the whole story in your head, it’s almost impossible to see where and why your mental picture isn’t coming through as well as it could on paper. It’s like when you’re telling someone a story and forget a key piece of background information you didn’t realize was important, but they completely miss the punchline without it. A developmental edit makes sure there are no snags or hurdles in the writing that might confuse readers or pull them out of the flow, without changing the bones of the story itself. It’s a fine line, but someone’s gotta do it! In your experience at Tor, what are some of the main reasons a manuscript will benefit from professional editing? We’ve all hit “send” on an email we checked a hundred times just to catch an obvious typo the millisecond before it whooshes away to the recipient. Most email browsers have taken pity and incorporated an undo function for just such mortifying occasions, and an editor functions as the same safety net for the publishing industry. As a writer myself, I know we can get in patterns of ways we like to do or phrase things that are either incorrect or repeated to excess. I call these “author fallbacks,” and the most annoying thing about them is you never notice you’re doing it until someone points it out. It can feel like throwing your novel to the wolves to hand it off to someone who doesn’t share your passion or familiarity for the story and the characters, but readers won’t have the benefit of all that knowledge either, so having an outsider perspective is not just invaluable but essential to crafting a compelling story. All the better for the author if that outsider perspective can also offer constructive suggestions and support in fixing those fallbacks. With autocorrect and other editing programs on word processors, why do we still need human beings doing this job? It’s very funny when we see autocorrect snafus from other people, less entertaining when they end up in our finished product. Even something as simple as spell check in a word processor can be led astray with words that aren’t in its limited dictionary or words an author might make up, such as character or place names. Features that look at grammar are even less reliable, and don’t allow any room for authors to explore and experiment with syntax. Sometimes, the offered suggestions just don’t make sense, and “accept all” will end with your manuscript reading more like an elaborate Mad Lib than a cohesive story. A human editor, while never perfect, is not simply running an algorithm on your novel; they are experiencing the world you created and looking for ways to make that experience even more enjoyable for the next reader. I’m unsure whether my manuscript needs a full copy edit. Can you describe the sample chapter edit you offer? Most online editing services take an all-or-nothing approach to submitting a manuscript. There’s no opportunity for an author to know what they’re getting into or to back out before paying for a full manuscript edit. We wanted to provide a sort of middle ground, where authors could give us a significant sample of their work—other editing services will offer a few pages, at most—and determine if Foreword’s services were the right fit for them and their manuscript. Something unique we’re doing is also offering this for developmental editing on up to 4,000 words. It’s an act of trust, really, to pass your manuscript over to what you hope are capable hands. We wanted to create an avenue to baby step toward that level of trust; a look before the leap, so to speak. I think it will be helpful for both the author and the editor to have that introduction, and the $119 cost is applied to the full manuscript cost if they choose to go forward, so there’s really nothing to lose.